The Queen is here now for the Commonwealth Games, and according to the British media, the trip will be her last. A smiling Queen Elizabeth II showed no sign of fatigue as she arrived in Australia for what some say will be the ageing monarch’s last overseas trip. 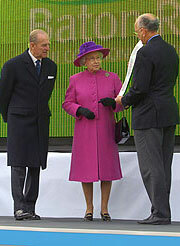 This week’s visit – to open the Commonwealth Games in Melbourne – is her 15th since the then newly-crowned Queen first visited Australia with her husband Prince Philip in 1954. With the monarch turning 80 next month, British newspapers have speculated that she will hand over more of her duties to her eldest son, Prince Charles, including her travel. Yipee. From now on, we get King Prince Charles. Yuk!